Purchased the BluRay plugin to allow me to author BluRay and burn but it won't install. Tell's me that setup cannot find a valid version of the software to upgrade. New Dell i7 Win 7 Pro only 3 weeks old. 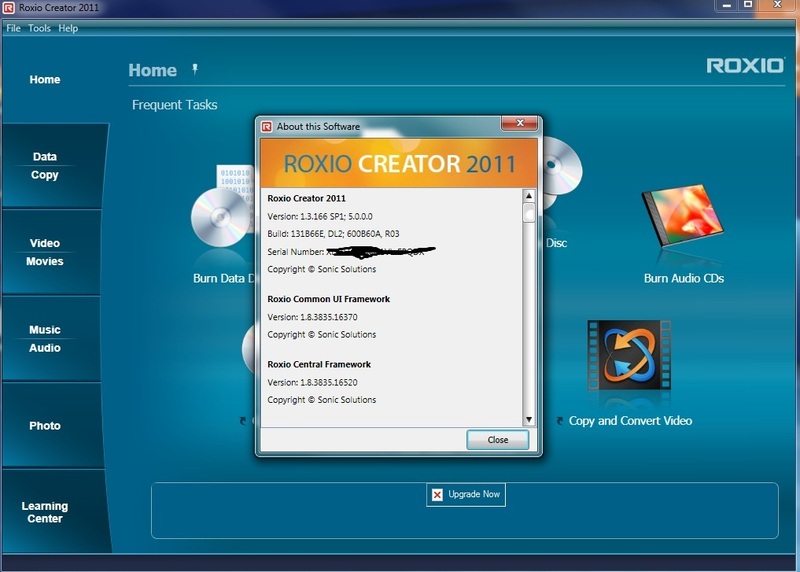 Purchased Roxio Creator 2011 with the laptop thru Dell. 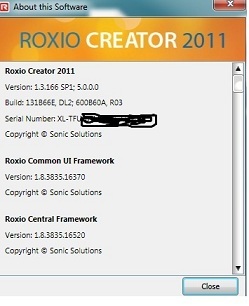 Verified that Roxio Creator 2011 is up to date. It is. Updated Windows to make sure it has all patches. It does. Been going thru this with Roxio support. They've escalated it to Level 2, whatever that means. Anybody have this issue. Any help would be appreciated. Post a screen shot of the "about" page of the Creator 2011you bought. Sometimes Dell (and others) sell special versions of the software. Do you have any problems with the Creator 2010 software except for the blu-ray update? Is this what you bought? I purchased a new Dell XPS and have had it for about 3 weeks. 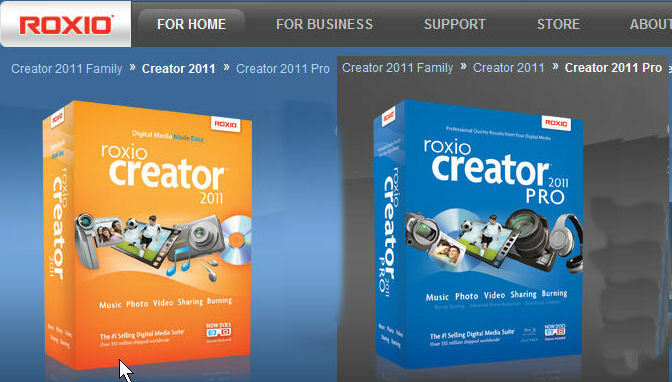 I purchased Roxio Creator 2011 when I purchased the laptop thru Dell. I was charged for it. It came in with it and I can edit and run Creator 2011 fine. I have a bluray burner on the laptop and want to burn BluRay. I went to Roxio's site, purchased the BluRay plugin to author BluRay (burn discs). Setup cannot find a valid version of the software to upgrade. I've had discussions with a couple of Roxio support folks and am very disappointed. It's been 3 days and all I've gotten is that the ticket has been escalated to Level 2. I've sent them screenshots of the Roxio version and specific diagnostics they had me run. This is so frustrating for a $19 plugin that should have come with the app to begin with. If anyone has a fix, please let me know. We are not support ! Make3 the jpeg smaller. 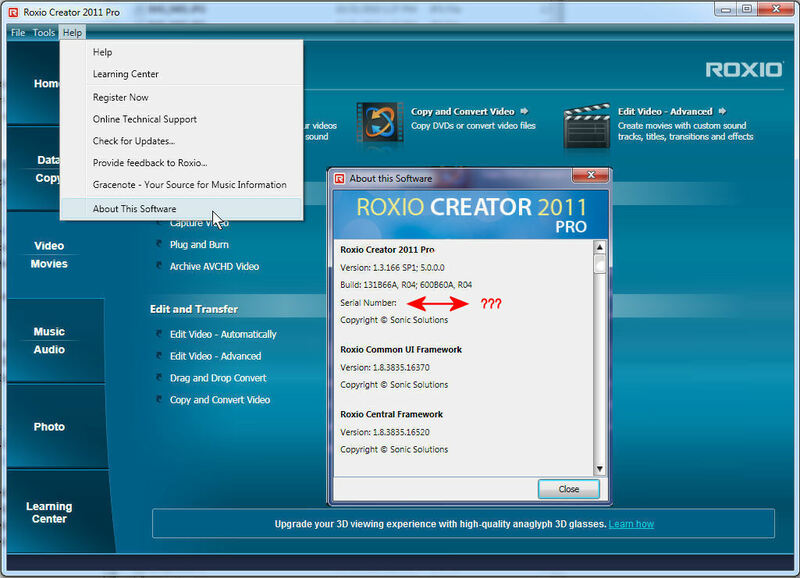 Roxio told me that the BluRay plugin to author (burn) blu ray DVD's is not compatible with the OEM version (the version Dell installs when purchased with a new PC) of Creator 2011. I called Dell and they told me the OEM version that's purchased supports BluRay burning and it's included. I thought, great, I'll give it a shot. When I go to create a DVD, the BluRay selection is grayed out. Only choices are DVD, VCD/SVCD and AVCHD... It shows Blu Ray but it won't let me select. Is there another way to tell it you want to burn a BluRay? Why not go to Dell and ask them why you can't burn BlueRay as they claim? I suspect that the person you spke to at Dell doesn't know what he/she is talking about. Since it is a Dell OEM version they are responsible for any issues you are having. That is part of the agreement they made with Roxio. Looking at your screenshot above, it looks like you have the Standard version which does not have the capability to burn "video" BlueRay discs but you may be able to burn data to BlueRay discs. To authour video BlueRay discs you need the "High-def Blu-ray Disc Plug-in"
Which one does it look like? Did you get this resolved? I have the same problem. Sounds like I have almost same computer as you. Dell XPS with bluray burner. I bought Roxio 2011 separately. Roxio does recognize the blank bluray disc. Which version of Creator 2011 do you have? The 'pro version has the blu-ray plug-in, the other version dosn't and that had to be purchased separately. Did you indeed pay for Creator 2011 or was there a OEM version that came with the Dell. That OEM version burns only blu-ray data discs and not Movie discs. What is no longer available is the blu-ray add on to CinePlayer to play commercial blu-ray discs regardless of what version of CinePlayer you have. Call Roxio sales during their normal working hours.